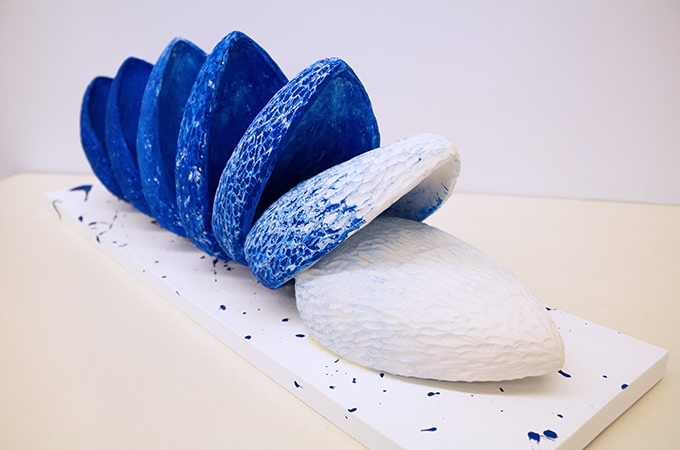 Graphic design-creative writing double major Taylor Matousek '18 created “Foam” from plaster, acrylic, and pine. I was technically supposed to have taken all of the prerequisite courses before I got anywhere near an intermediate course, but my relatively late decision to change my art minor to a major made for a few complications. Plus, I was doing my best to avoid a certain class. I understood the logic behind it, of course: the idea of a liberal arts education is to explore a variety of subjects, even within your major. Even if that dreaded subject is sculpture. “Transcendence” is made of pine and stain. At Redlands, Liberal Arts Foundation (LAF) courses and major/minor requirements will undoubtedly, at some point, thrust you into a classroom that might not have been your first choice. As a graphic design major and an avid photographer, I’m accustomed to the more technology-driven approach of working behind a lens and with 2-D objects on a screen. Sculpture, however, is very much the opposite, so I was concerned that I wouldn’t enjoy the class. I was also worried about how time-consuming it would be; not only do the majority of art classes meet twice a week for three hours, but they also come with the expectation of several hours’ work per week outside class. Throw in an unhealthy dose of perfectionism and it can be a recipe for a heaping plate of stress. The first week of class centered around the beginning of our first project, which was to encompass the concept of “modularity.” We were to design a module (e.g. a brick) that we could replicate multiple times in order to make something “bigger” (e.g. a brick wall). We started by gathering ideas and creating sketches. Inspired by the architecture of the Sydney Opera House, I sketched out a hollow teardrop shape and talked the idea over with my professor, who then handed me a slab of wet clay so I could begin construction of my model. As soon as I sank my hands into the clay, I was hooked. While I created my model out of clay to capture an organic shape, other students with more geometric designs used cardboard or Styrofoam. Our sculptures were ultimately to be made out of plaster, so once we were satisfied with our models, we began making molds. It was a long process that involved several trips to the sculpture studio outside of class to add layers of rubber and plaster. It felt like a miracle when we were finally able to break the molds open and start using them to cast our modules. Then came the fun part: remembering to spray the inside of the mold with release between each casting, clamping the mold shut without breaking it, and pouring the plaster while hoping beyond hope it wouldn’t leak out of the bottom (mine started to leak on my fourth casting, so I had to get creative and slap some clay on the problem area). Once the plaster reached the warm point of its setting process, we carefully pulled our molds apart to remove a module. When I’d finished casting, patching, and sanding seven modules, I textured each one and rubbed on acrylic paint with a rag. Mounting my modules was probably the most nerve-wracking part of the process, as they wouldn’t stand up on their own in the domino effect I desired. I used a strong adhesive to glue them to a wooden board and to one another. When I came back the next morning to make a few paint touchups, I was thrilled to find my masterpiece hadn’t fallen apart. Finally, the time had come: critique day. Mugs of coffee in hand, my classmates, professor, and I shared our thoughts on each sculpture, noting everything from the texture to the color to the arrangement of the modules. The sole student who had decided to use Styrofoam for his model ended up with a stucco-like texture on his finished piece. Another student, having created several Romanesque columns as his modules, chiseled away at each in varying amounts and completely broke the last one in half, a commentary on how Nature reclaims what humans create. One of my favorites involved several chili pepper-shaped modules displayed on wooden dowels at different heights. After a thorough examination and discussion of each sculpture, we set up a small area to photograph our masterpieces. We spent the rest of the semester working on two more large projects, the first of which involved woodworking. We were to make a sculpture out of pine, based on the poem “The Soul” by Katie Ford. I wasn’t a fan of woodworking at first, but I hadn’t been a fan of sculpture at first either, and soon the power tools and dorky goggles and dust mask began to grow on me. Once I figured out which tools I preferred (the table saw and chop saw) and which ones terrified me (definitely the nail gun), woodworking became my favorite form of sculpture despite always being covered in sawdust. 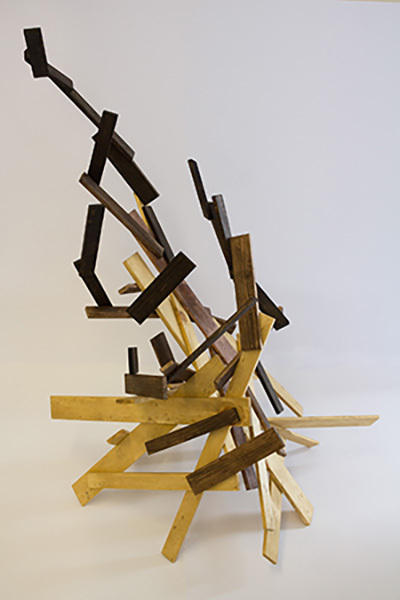 By the end of the project, I’d become known as a clamp hoarder and a glue master, as my sculpture, an abstract representation of smoke, was held together only with wood glue and patience. For the final project, our professor sent us on a scavenger hunt with the instructions that we could use literally anything to make a sculpture, so long as it represented the concepts of vanity and materialism. Some students used broken mirrors, others used dead flowers, and one student even commandeered the recycling from Frat Row. I used leftover wood from the previous project (and the dreaded nail gun) to create large picture frames that held various items collected from friends, thrift shops, and my own belongings to represent the way people portray themselves to the world.